HUGtto! PreCure, Kaitou Sentai Lupinranger VS Keisatsu Sentai Patoranger, and Ultraman R/B. Bandai Namco has announced Nari Kids Park: HUGtto! 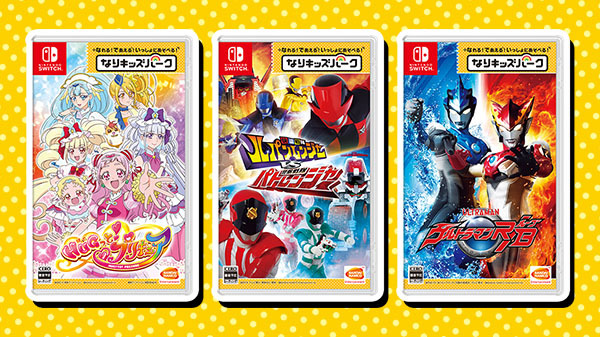 PreCure, Nari Kids Park: Kaitou Sentai Lupinranger VS Keisatsu Sentai Patoranger, and Nari Kids Park: Ultraman R/B for Switch. All three titles are part of the company’s new Nari Kids Park series project and will launch on November 21 in Japan for 4,800 yen each. Each game will also support up to two players. Find a brief overview of each game below. HUGtto! PreCure, which broadcasts on ABC TV and TV Asahi every Sunday at 8:30 a.m., joins the Nari Kids Park series. Transform into Cure Yell and the others and have fun! Find out more at the game’s official website. Early purchases include a download code for a Christmas short talk between Hana Nono, Saaya Yakushiji, Homare Kagayaki, Emiru Aisaki, and Ruru Amour. Kaitou Sentai Lupinranger VS Keisatsu Sentai Patoranger, which broadcasts on TV Asahi every Sunday at 9:30 a.m., joins the Nari Kids Park series. Transform into Lupin Red and Patren No. 1 and have fun! Find out more at the game’s official website. Early purchases include a download code for a Christmas short talk between all the Kaitou Sentai Lupinrangers and Keisatsu Sentai Patorangers. Ultraman R/B, which broadcasts on TV Tokyo every Saturday at 9:00 a.m., joins the Nari Kids Park series. Transform into Ultraman Rosso and Ultraman Blue and have fun! Find out more at the game’s official website. Early purchases include a download code for a Christmas short talk between Ultraman Rosso and Ultraman Blu. A new project from Bandai Namco Entertainment created with the concept of “digital transformation and play,” where players can “become,” “meet,” and “play together with” the heroes and heroines they see on TV. “Become” your favorite heroines and heroines on Nintendo Switch. “Meet” your favorite heroes and heroines. And “play together with” your family and friends. With various ways to play, this project is a wish granted for children who want to become heroes and heroines. Find out more at the series’ official website. Watch the announcement trailer for each game below.